Packing tips – Safety of your belongings. With our packing tips and your due care and attention plus a little bit of planning, you and your belongings can both arrive at your new home in tip-top condition. If you decide to use He-Van packing services, we will loan you all the boxes that you require and just charge you for the consumables such as wrapping paper, bubble-wrap and tape. Otherwise, if you wish to do your own packing, it does pays to purchase the right packing materials in order to fully protect your fragile or valuable items. Sturdy book boxes, large boxes and wardrobe boxes, wrapping paper, packing tape and bubble-wrap can be purchased and delivered free via our packaging materials page. In addition to the items mentioned, you could also use blankets and pillows; even clothing can serve as a buffer between breakable objects. Packing for moving with good technique and the right materials can mean an easier move and fewer chipped dishes and cracked ornaments. A little common sense goes a long way. Think and visualise the journey ahead so that you can pack effectively and efficiently. Here is an example; think of a stack of plates packed into a box in the back of the removal van. No matter how well the sides are padded, a firm up-and-down jolt could in theory crack the entire stack of plates. On the other hand, plates packed on their edge and surrounded by bubble-wrap and lots of paper have a much better chance of survival. 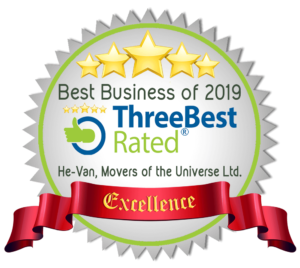 He-Van will of course take great care with all your belongings whilst transporting them, but it will be a good decision on your part if you take that extra bit of care your end. Once your ready to start packing for your move and have all the tools of the trade so to speak, try following the He-Van packing tips below. Not all of the packing tips may be applicable to you, however some of the packing tips will be of great use. If you don’t want to pack or it is all too much for you, don’t panic, just ask He-Van, and we will do the packing for you, we will even unpack at your new property should you so desire. Pack one room at a time – once you have packed a room, perhaps use it as a packing room, keep all packaging materials together and have an area where you can pack onto, such as a table or kitchen work top. If space is tight, put two large boxes on top of each other, this will provide a small but secure packing space where you can stand straight without bending over. Label each box with a description of its contents and its destination (e.g., kitchen, bathroom). 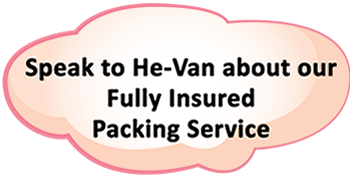 Be as specific as you can as it will make unpacking that much easier and He-Van will know which room to place your items in. Tape the boxes underneath following the line across the box and ensure you rub the tape down to secure firmly. A couple of strips will suffice. Secure the tops with one strip of tape and ensure that all boxes are sealed so that they can be stacked on top of each other in the van. It is very important to use quality strong tape, otherwise the bottoms of boxes can fall out, and you don’t want that to happen. Use wrapping paper – to wrap and protect china, crockery and glassware, ornaments and small picture frames / mirrors. 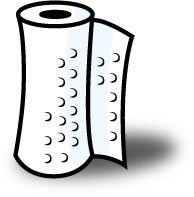 Paper is also useful for dividing clothes in boxes and to wrap pen pots and other fiddly bits that may fall out into the box you have packed. Use bubble wrap – to wrap and protect your more precious china, crockery and ornaments in addition to vases and medium to large pictures and mirrors. 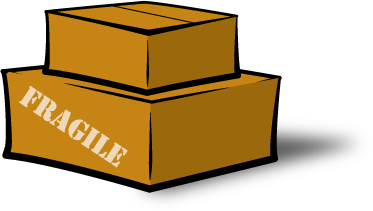 Keep the weight of your boxes reasonable – if at all possible, put heavy items in smaller book boxes to make them easier to carry. Use book boxes for books, don’t use large boxes. Mix the book boxes up with hardback and paperback books, distribute the weight, but, always fill the boxes to the top, otherwise they face getting crushed. When choosing the size of box that you require – pack kitchen crockery, fragile ornaments and frames, contents of drawers, documents, office bits and bobs into book boxes. 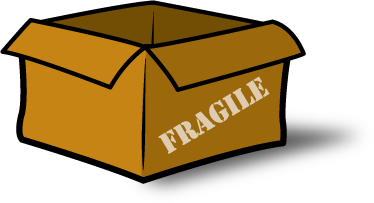 Use large boxes for bedding, clothes, cushions, toys, kitchen pans, kitchen equipment, board games, big folders and the odd oversized book and anything else that is not fragile and that is not suited to a book box. Don’t apply tape directly to polished or painted wood finishes – removing the tape could ruin the surface. Test if unsure or put paper underneath the tape in the area that needs protection. Double-box fragile items – and add plenty of cushioning. Write fragile in big letters on the box or better still use fragile tape. Use rough paper scrunched up as a base and top within any fragile box you are packing. Stop items moving around by using scrunched up paper to act as a filler in between objects, additionally, you may also need to pack the sides of the box with rough paper. When packing pictures – put smaller pictures into a large box interleaved with bubble-wrap and rough paper as a protector for the sides, base and top. For any pictures that do not fit into a large box, you can either bubble-wrap and wrap with brown paper or if on a budget, you can bubble-wrap the corners of the pictures only, sufficiently so that there is approximately half inch of bubble-wrap on each side of the corner. When He-Van Removals arrive we will put similar size pictures together and cover with large removal blankets, taped and sealed if necessary. The bubble-wrapped corners prevent any pictures from touching each other. Mirrors can be wrapped in bubble wrap and will also be blanketed in the removal van. Pack essentials separately in a separate box – think of those items that you will need first hand in your new home, like the kettle and some mugs for example, teaspoons, tea, coffee, biscuits (that’s a hint by the way). Commonly known as the last box out, first box in! Prepare for the first night in your new home – pack essential items in a separate bag and carrying it with you. You may even want to prepare a simple meal that you can heat and serve on your first night or perhaps a take away will be on the agenda. For each person in the household – prepare a change of clothes, a towel, prescription drugs, a toothbrush, and other personal items. For everyone – use plastic utensils, paper crockery, paper towels, toilet paper, toiletries, trash bags, a flashlight, first aid kit including pain relievers, pencil and paper, snacks, beverages, and re-closable plastic bags. Small tool kit – for re-assembling items that couldn’t be moved whole. 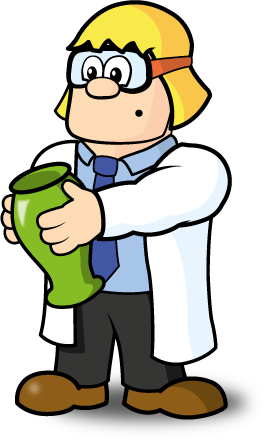 Otherwise get He-Van to put your items back together, something we would normally do if we dismantled the items in the first place. There is no reason why your household goods should become casualties of moving! Follow our packing tips and save your self some hassle. That all white appliances – (washing machines, freezers, fridges, dishwashers) where applicable… are emptied, drained and disconnected before our arrival. 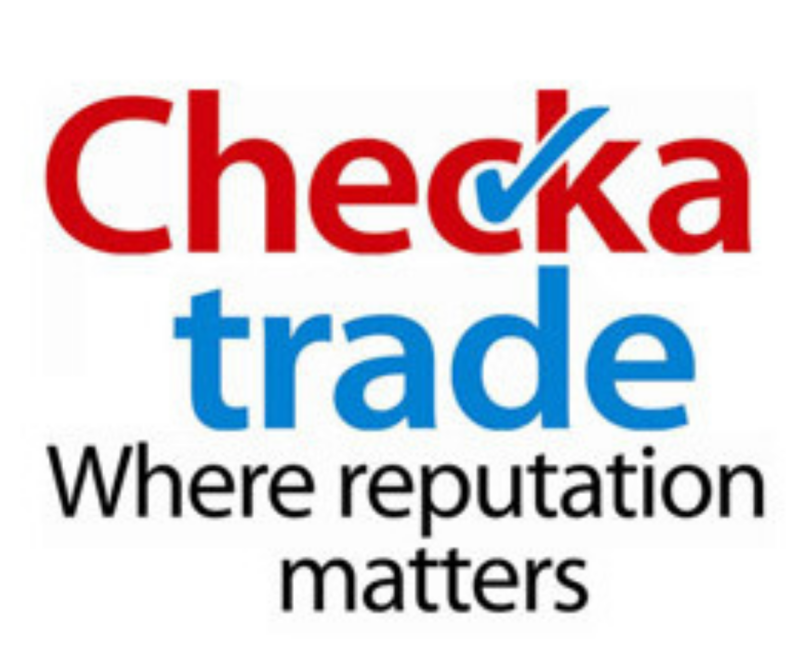 Our insurance does not cover our staff disconnecting any equipment such as white goods. The inside and outside of all appliances – should be clean as this will protect from slippage when moving items and prevent getting dirt on your precious items and our staff. That you tape down – any parts of the equipment or machine that could come loose such as the burners on your stove and the electrical cords. 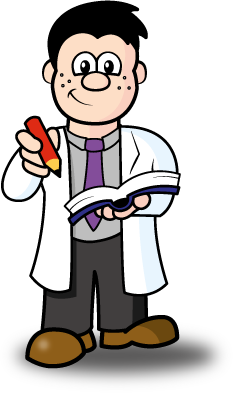 He-Van will remove shelves in a fridge, however if you are packing yourself, why not pack them at the same time. You can put the washing machine hose and pipes in the drum itself. That all corridors and access routes – are clear of boxes and furniture so that our movers can pick and choose the items required to load the removal van appropriately. As well as our packing tips, you can also check out our moving tips for more useful information on parking and loading. Good luck and remember He Van is here to help. 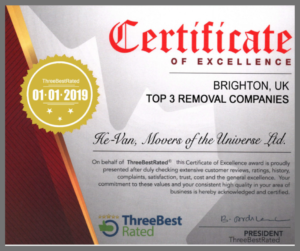 Just call us on 01273 311293 or email hevan@brighton-removals.co.uk .